The middle element had properties that were an average of the other two members when ordered by the atomic weight (the Law of Triads). Any given element will show similar behavior to the eighth element following it in the table. Plotted the atomic volumes of the elements against the atomic weight, and found that the chemical properties of the element recur periodically. Also notice that the elements occupying the corresponding position of the curve show similar chemical properties. arrange the elements according to the ascending order of atomic mass and put all the elements that have same chemical properties in the same group. left empty space in the periodic table for elements that haven’t been discovery at that time. Although he arranged the elements in ascending order of the atomic mass, he changed the order if the chemical properties of the element did not match its group. From the empty space present in his table, he even predicted the existence and properties of unknown elements which he called eka-aluminum, eka-boron, and eka-silicon. managed to measure the proton number of atoms. arranged the elements in the periodic table according to the ascending order of the atomic number (proton number), but not the atomic mass, as done by Mendeleev. managed to predict the existence of four undiscovered elements from the proton number. In modern periodic table, the elements are arranged in ascending order of proton number. The vertical columns of the periodic table is called GROUPs whereas the horizontal rows is called the PERIODs. The vertical columns of the periodic table are called Group. All the elements in the same group have same number of valence electron. Thus, elements in the same group exhibit similar chemical properties. The Group is named according to their position in the periodic table. For example, the first group is called Group 1, the second group is called Group 2 and so on. Group 3 to Group 12 are categorised to another big group, called the Transition Metal Group. Group 1, 2, 17 and 18 have trivial name, as shown in the table below. The horizontal rows is called the PERIOD. There are 7 periods in period table. The first period only has 2 elements only. The second and third period consist of 8 elements, are called the short period. The forth and the fifth period consist of 18 elements, are called the long period. The sixth and the seventh period has 32 elements. All the elements in a same period have equal number of electron shell(s) (orbit). For example, the electron arrangement of calcium is 2.8.8.2. It has 2 valence electron and 4 electron shell. Therefore, it is placed in Group 2, period 4. 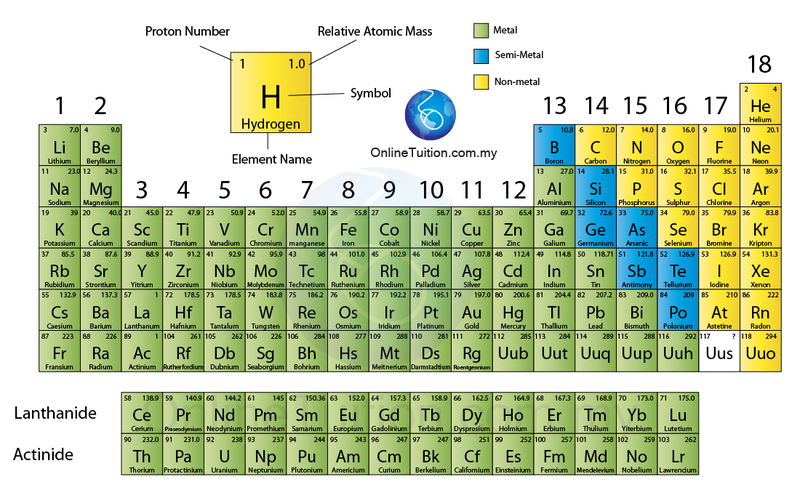 Hydrogen, the simplest element atom, with 1 electron, does not fit into any group. (Even though some of the periodic table place it in Group 1, due to its 1 (and the only one electron) valence electron.